July 27, 2010 was a day that started out much like any other. Breakfast, coffee on the deck, and then Gary went to run some errands. When I heard the sirens a short time later, I just knew that it was Gary. When Gary and I were introduced, we knew instantly that we were meant to be together. It was true love from the moment we met until the day he died. We romantically eloped to Jasper, then quickly set about starting our life together – building our dream home and having our dream son. Our home was a huge source of pride for Gary, and he loved building the toboggan hill with my brother in our back yard. It took days to plan and build the hill, which included turns and jumps. As our son and nieces got older, Gary built a skating rink in the middle of the yard. So many weekends, year-round, were spent in that backyard sitting around a fire. Gary loved people, and was happy when he could host a dinner (he made the best turkey), a party, or even a poker game. 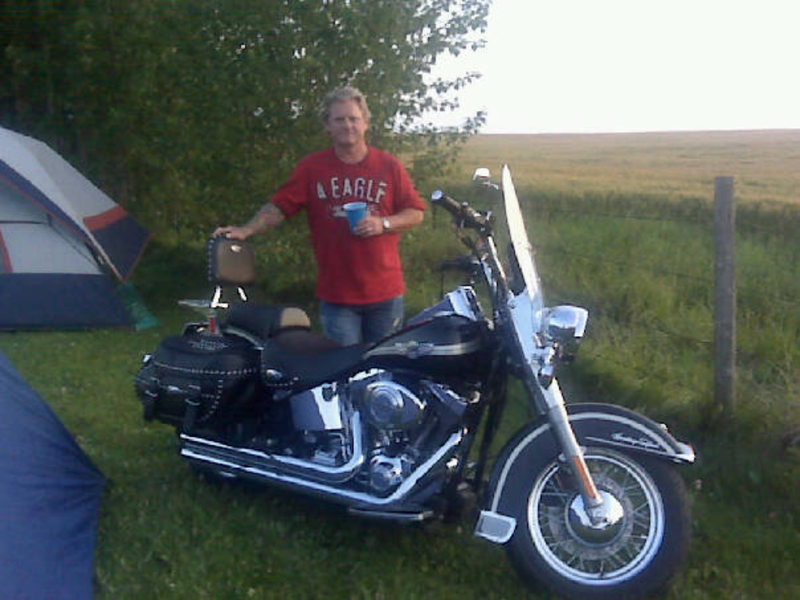 Gary was a loving husband, an amazing father, a son, a brother and a friend to many. Gary would offer a hand to anyone that needed it, and was the kind of man that you just wanted to be around. One of the things I miss most is when Gary and I would go out into the back yard, late at night, just the two of us, to flood the rink. It would be silent, except for the sound of the water flowing on the ice, and we would just “be”, together. Sometimes we would get silly and slide around on the new ice…. It was a special time. We sincerely enjoyed each other’s company. From the day we met, I can count on one hand the amount of times we were separated. Once Payton was born, we were a “gang”! Whenever there was one, you could expect the other two weren’t far behind. I’m so sad that my little boy will not get to grow up knowing his father – I can only hope that the memories he had until he was ten will live with him. 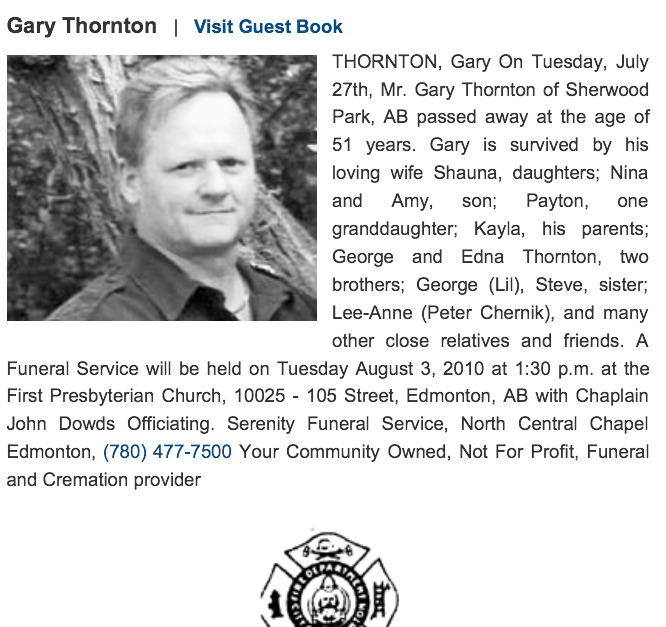 Gary was a firefighter in Edmonton and had recently become captain of the station. I use to worry about the dangers of being a firefighter, but Gary took such price in helping other people. He had the greatest sense of humor, and he loved to play practical jokes. You never knew what to expect when you were working at the fire hall with him. 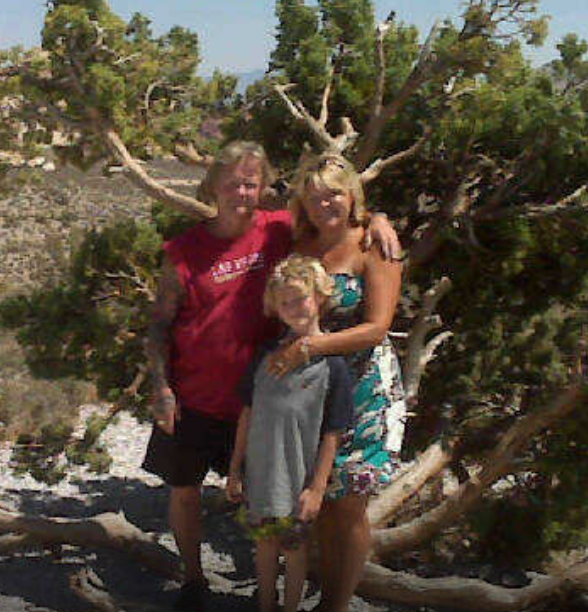 As a firefighter, Gary saw the aftermath of many accidents. He knew the importance of wearing a seatbelt and made it a practice to always wear his seatbelt. Why he wasn’t wearing it that morning is a question we will never have the answer to. Gary was minutes away from our home when he lost control of the car. Maybe he was preoccupied with something, or was changing the station on the radio, or swerved to miss an animal. We will never know what caused the single vehicle accident, or why he wasn’t wearing his seatbelt. His car veered to the side of the road, hit the gravel, flipped, and Gary was thrown 30 meters from the car. Gary was pronounced dead at the scene. When I showed up at the scene of the crash, they wouldn’t allow me to see Gary, which is probably for the best. The following days were a blur of friends and family offering support and condolences. Three years have passed, and it doesn’t get easier. In that split second, so many lives were changed forever. I lost my partner, my son lost his father, and countless other people lost a very special person.